HOW TO MAKE Chole Bhature ? Soak the chole overnight or for 5-6 hours. Drain them and wash with fresh water. Add salt (to taste), 1 tea bag and water to it. Add chole and boil them. Heat it and add 2 bay leaf and cardamom. Add 1 tsp cumin seeds, 1 tsp fennel seeds, 3/4 tsp asafoetida. Add chopped onions, tomatoes and green chilies to it. Add 1 tsp red chili powder, 1 tsp coriander powder, 1 tsp garam masala to the pan. Add fenugreek leaves and coriander leaves. Mix it and simmer it for 10-15 minutes. Take a big bowl and add maida to it. Add baking powder, baking soda and salt to it. Add yogurt and oil to it. Knead dough and add water if needed. When done, cover it with damp cloth. Make small balls and flatten them with rolling pin. Serve hot bhature with spicy chole. Preparation For Chole : Take 3 cup chole and soak it overnight or for 5-6 hours. You can also add 3/ tsp of baking soda to it. At morning, drain the chole and wash 2-3 times with fresh water. Now take a pressure cooker and add 2 glass of water to it. Add salt (to taste). Add chole to the pressure cooker. Now add 1 tea bag it will help in dying the chole in black color. How To Cook Chole : Take a pan and add 2 tbsp oil/clarified butter to it. Heat it and add 2 bay leaves to it. Add cardamom, 1 tsp cumin seeds and 1/4 tsp asafoetida to the pan. Allow them to sizzle. Now add grated or finely chopped ginger to it and sauté it for 3-4 minutes. Add finely chopped onions to it and simmer it until it turns golden brown in color. Add finely chopped tomato and green chilies to it. Stir it. Now add boiled chole to the pan. Give a stir. Now Add spices to it. Add 1 tsp red chili powder, 1 tsp coriander powder, 1 tsp garam masala to the pan. Mix it thoroughly. Add 1 glass of water. Rub Fenugreek leaves between your palm and sprinkle on chole. Add finely chopped coriander leaves to it. And simmer it for 10-15 minutes. Make Balls From Dough : Now make balls from dough and flatten each ball with the rolling pin into big sized puri. You can also make stuffed bhatura. For that take 2-3 boiled potatoes and add 1/2 tsp red chili powder, 1 tsp coriander powder and coriander leaves to it. Now stuff the small ball with the filling and then flatten it. How To Cook Bhature : Take a pan and add required oil/clarified butter to it. Heat it. Now add bhatura to the pan and deep-fry it on medium flame until it turns golden in color. Fry it from both sides carefully and lightly. Take Out Bhature with the help of slotted ladle, to drain extra Ghee or oil. 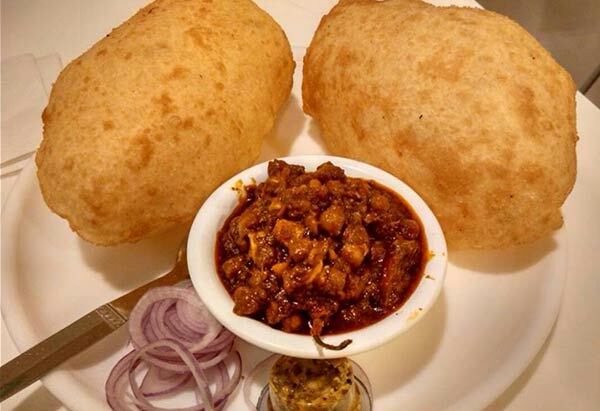 Serve hot bhature with hot spicy chole curry.